In many industrial objects there are emitted dusted gases of high temperature. Mostly it regards glass works, aluminum works, copper works as well as foundries and cement mills where gas temperatures may reach 550-600 °C. The filtration process on filtrating bags must not take place under such conditions. In order to lower the temperature to a level acceptable for bags that is up to 260 °C., we offer gas cooling systems. Temperature reduction is performed in two ways. The first one consists in distribution of cold atmospheric air and mixing both of the streams. Because of substantial increase in gas volumes, which must be filtrated at the next stage, it is not economic and it has been abandoned. The second gas cooling method takes place by means of a cooling system (pipe heat exchangers). It consists in cooling of hot gases without a need for stream of external air supplied into a stream of hot air. System operation is based on a convection process ( transfer of heat energy from hot gases into a cooling agent). A cooling agent may be a gas (the most frequently it is the atmospheric air or a liquid (water or oil)). Exchange of the heat energy takes place by means of exchange pipes' walls. Such a system enables also a situation where the cooling unit is the first de-dusting stage. 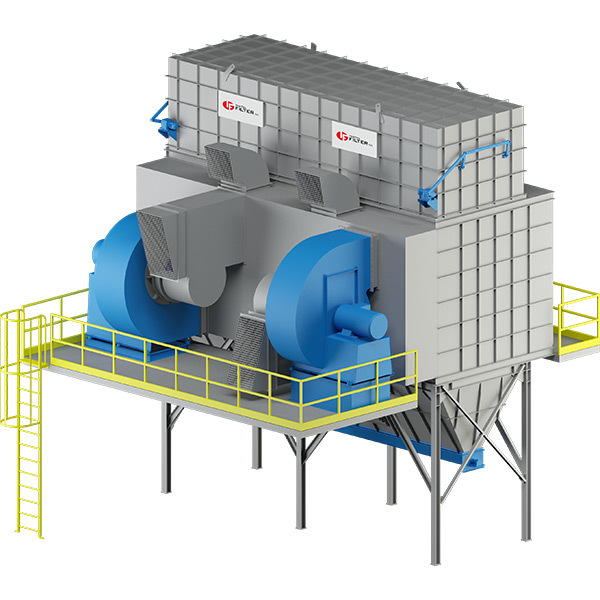 There are precipitated thicker particles of dust contained in a cooled gas. In case of cooling down of fumes with dust, which is prone to adhere to the surface of walls, we apply so called chain cleaning system. It prevents dust layers on the surface of cooling down pipes. Direction of flow of cooled down gas takes place downstream and cooling agent - perpendicular to it. 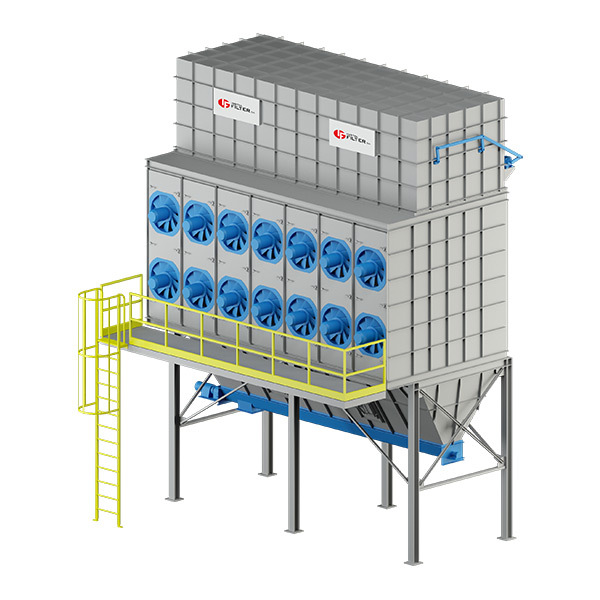 Such a system supports the process of falling down of dusts separated in the dust exchanger chamber into the chute. In case of exchangers applying cooling gas, it is pumped into the exchanger pipes by means of axial or radial fans. In case of exchangers with liquid, there is applied pressure of the supplying system. In terms of structure - typical exchanger is similar to horizontal bag filter. Instead of filtrating bags, in the exchanger chamber there are exchanger pipes. In the housing of the exchanger there are large, inspection door in order to enable service and exchange of elements. On the door there are fastened cooling fans (for large units it is possible to fasten radial fans near chamber of the exchanger). Over the heat exchange elements there is an element where there is located a driving system of the exchanger pipes cleaning system. KLN type - without cooling air re-circulation. Temperature of cooled down gas can be regulated only by switching on relevant quantity of cooling down fans. There is no option of cooling down temperature adjustment (ambient air is sucked). KLR type - with cooling air re-circulation. Since the cooling down air re-circulates it is possible to regulate its temperature before it re-enters the exchanger.